No fewer than 31 persons have been killed, following the fall of a 400-year-old ancestral tree, in Umudagu, Mbieri, Mbaitoli Local Government Area, Imo State. Some of the victims were crushed while others were buried in the rubble caused by the fallen tree. 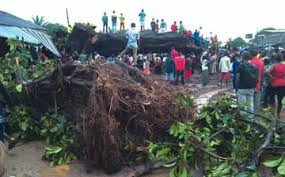 The tree, owned by Umudagu, Umuonyeala, Amauli and Umujam communities, in Ihitte Isi, Mberi Autonomous Community, which fell down at about 8:30 pm Thursday night, during a rainstorm, also left several others injured. Casualty figure was high, it was gathered, because the tree fell at the peak of commercial activities in a popular night market called “Ukwu Uko,” located under it. The market usually starts at about 3pm everyday and terminates at between 9.30pm and 11:30 pm. Saturday Sun gathered that the tree had been a source of concern to youths of the village, who had repeatedly made case for it to be cut down to no avail. Elders of the community had described the tree as an ancestral landmark that should not be removed. Sources revealed that discussion on the cutting down of the tree held the same day, in the town hall near the Ukwu Uko market, before the tree fell. The meeting, it was learnt, was to agree on the modality and necessary appeasements to the community’s ancestors before its felling. Saturday Sun gathered that the meeting was on when the rain that caused the fall of the tree started. Owing to the rain, the meeting was adjourned, it was gathered. When our reporters visited the scene yesterday, about people were seen wailing and searching for their wards, who went to the market Thursday night but have not been seen. Also, our reporters observed rescue efforts, with some youths digging to retrieve victims. Also on the rescue team were men of the National Security and Civil Defence Corps, men of the Nigerian Fire Service, some health workers and other security operatives. By yesterday, 11 corpses, including that of a baby, were recovered from the scene. The corpses were deposited at the mortuaries of Federal Medical Centre (FMC), Owerri; Imo State Specialist Hospital, Umuguma, in Owerri West Local Government Area and Aladinma Hospital, Owerri. Mr. Amarachi Obumnaonye, who escaped death by the whiskers, told Saturday Sun that he was under the tree when he heard a creaking sound. As he looked up, he revealed, he discovered that the tree was bent. He had raised an alarm and took to his heels. He revealed that other people, who were under the tree with him, could not run fast enough and were crushed.